Co-living offers more flexibility than the traditional 12-month lease. Earlier this year, when Cole Kennedy, 23, moved back to New York City to work at a startup, he bypassed the traditional real estate rites of passage — paying through the nose for a broker, searching Craigslist for potential roommates or lugging a futon up four flights of stairs — and instead unpacked his duffle bag and laptop at Common, a new common living (or “co-living”) space in Brooklyn. He didn’t even need to bring a toothbrush, because Common provided him one. Common CEO and founder Brad Hargreaves, who previously co-founded computer programming school General Assembly, says he hopes his startup (which plans to open several more buildings in New York next year) will alleviate some of the frustrations of urban apartment hunting. “In metro areas like New York, Washington, D.C., Los Angeles and San Francisco, it’s a struggle to find a place to live,” Hargreaves says. “[People] end up in roommate situations, matching up with people they met online through Craigslist, and they don’t necessarily know these people, there was no process, there was no vetting.” Common, on the other hand, interviews prospective members and runs criminal background checks. Co-living spaces like Common are popping up in a small number of U.S. cities and abroad (notably in London, where The Collective is slated to open next year), combining private and shared spaces with activities aimed at creating a deeper sense of community than you’d find in an anonymous high-rise apartment where residents avoid eye contact on the elevator or in the laundry room. Kennedy says he was initially leery of forced “family bonding activities” but has found that Common lets him interact with other residents on his terms. The community offers social events such as bowling and potluck dinners, and Kennedy helped create a book club with other residents. Another selling point: Co-living is priced comparably to studio apartments in the area (around $1,000 in Syracuse and $1,500 to $1,950 in Brooklyn, according to the respective founders) but often includes extras such as utilities, cleaning for the common areas and access to community events. (At around $850 per month, Commonspace actually costs less than a nearby studio option.) “We provide kitchen and bathroom supplies, coffee, tea — things that otherwise roommates would have to fight over what to buy,” Hargreaves says. (Kennedy says Common’s kitchens are so well-equipped he’s not even sure what to do with some of the gadgets.) The units are also fully furnished. 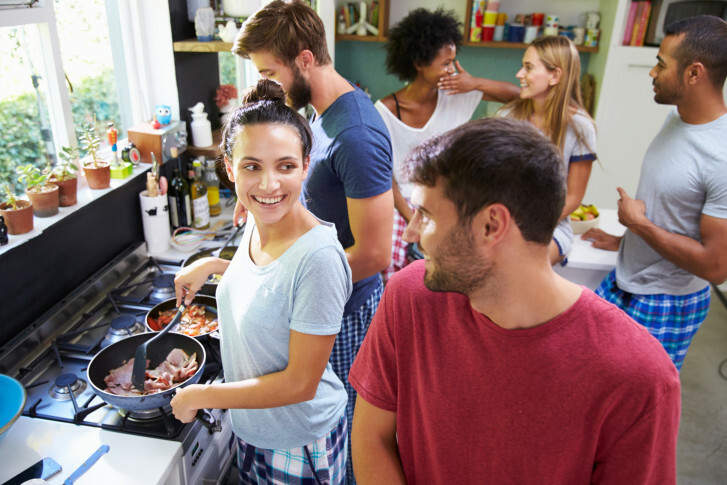 Co-living offers more flexibility than the traditional 12-month lease. Commonspace plans to offer a minimum six-month lease term (and is investigating shorter options), while Common’s minimum stay is one month. Hargreaves says this allows residents to move out if their personal or professional life takes them elsewhere while eliminating tenant-landlord tension over subletting (which wouldn’t fit with the space’s vetted community orientation).